The local community gave back to by giving blood through the Red Cross. South Gallia Leo students will benefit through community service and earning scholarship money through the event. MERCERVILLE — South Gallia High School makes giving a habit. 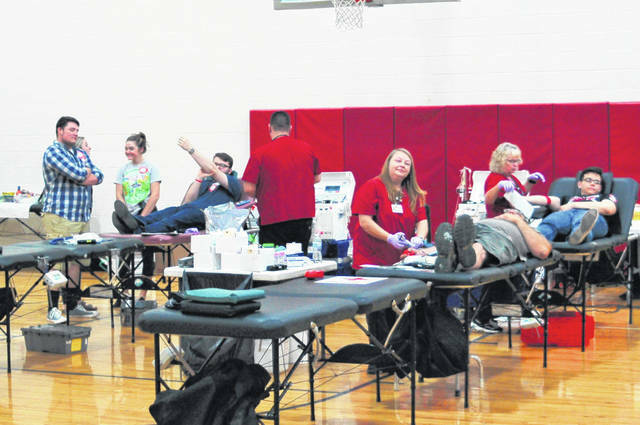 For the third year in a row the South Gallia Leos Club has sponsored and operated a blood drive through the American Red Cross. LEO Club is a student organization under the Lions Club, and intends to do charitable work and build character in students. Part of that charity is hosting and organizing blood drives twice a year; in the fall and spring. When a student organization like Leos sponsors a blood drive through the Red Cross, they can earn scholarships based on how much blood is donated. The goal for this year was two $500 scholarships for Leo students based on their community service and leadership. This year the Leos set a goal of 26 and surpassed it again with 29 units of blood donated. This marks the third year of the Leos Club at South Gallia, and they continue to increase in number and in their community service. They currently have 30 members, up from 25 last year. In the past they have continued doing community service projects such as blood drives, wrapping Christmas presents with the Lion’s Club, the special Olympics, and raising money for a new sign and outdoor furniture at the school. For more information about donating blood through the Red Cross, visit redcross.org. To learn more about the Leo Club, call South Gallia High School and speak with Mr. Fowler at 740-256-1054.